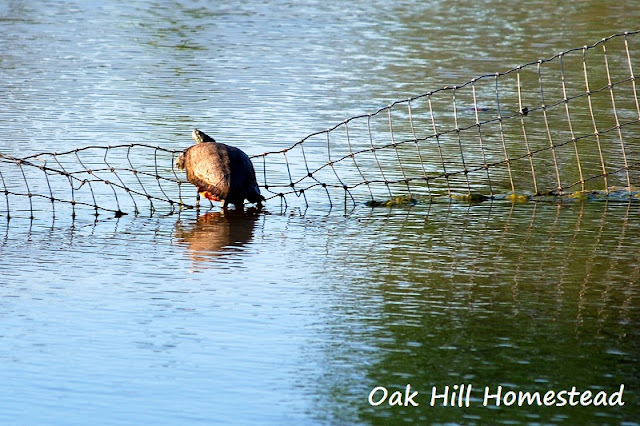 -- I've been trying for two weeks to get a good photo of the turtles sunning on the fence wire in the pond. They sense me coming and plunk back into the water before I get there. I finally managed to get close enough for a couple of shots, and then Cracker jumped into the pond and scared them off the fence. 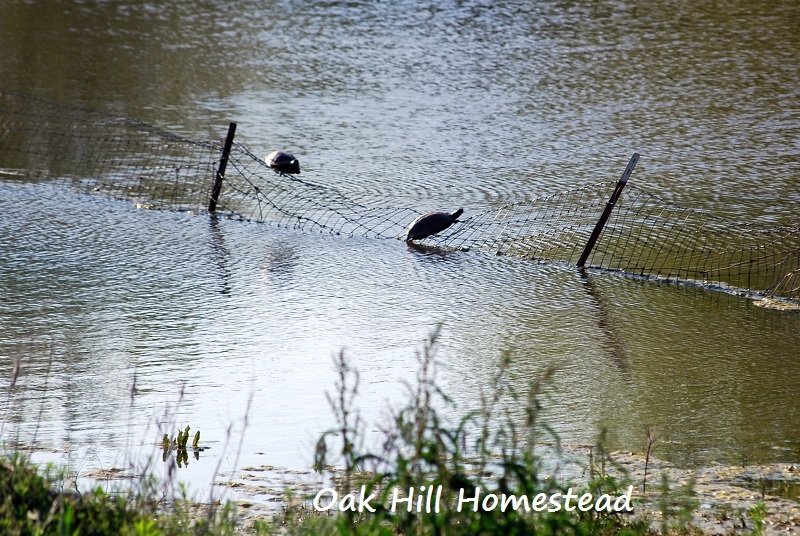 -- I've been blessed to see several uncommon bird sights this week: cattle egrets, a bluebird on a fencepost, a hawk plummeting to the ground with its prey, and a small owl in the middle of the dirt road as we drove home after dark. I do occasionally see cattle egrets in the summer; they are smaller white cranes that follow the cattle around the pastures, eating bugs in the cattle droppings. As well, I enjoyed seeing both a blue heron and a great white egret at opposite sides of a roadside pond. -- On the other side of the coin, the horse flies are already bad, and there was a snake in the chicken coop. No wonder egg production had dropped off suddenly a few days before. -- The wildflowers are blooming profusely, a palette of bright color in fields and along roadsides. A neighbor's crimson clover is blooming, interspersed with yellow patches of an unknown flower. Indian paintbrush patches are everywhere, lush from the spring's rain. The wild indigo is in bloom. We are too far north for Texas bluebonnets but I'm guessing they too are prolific this year; I hope someday that we can take a drive to see them. -- Each time we have frost in the morning I hope it is the last time. The tomato clones have taken over my kitchen and there's no room for food preparation. I looked up our average last frost date: April 15th. In fact, Dave's Garden says: "Each winter, on average, your risk of frost is from October 28 through April 3. Almost certainly, however, you will receive frost from November 9 through March 22. You are almost guaranteed that you will not get frost from April 16 through October 14." They're a little off this year. This morning we had a frost warning, but our thermometer read 34 so I think we escaped damage -- I hope. -- Last Saturday our 4-H horse club put on a benefit trail ride at a nearby lake. The night before it had rained and hailed on top of the already-muddy trails, and the day dawned cold and windy and dark. We were thrilled to have riders and horses show up anyway. It wasn't a large turnout, but we are thankful for those who did brave the weather and the mud and the full creek crossings. It was a wonderful day spent with old and new friends.